National Housing Day: Tory plans will barely scratch the surface of the crisis in social housing, writes Kevin Gulliver. Pic: Theresa May addresses the National Housing Federation earlier this year. 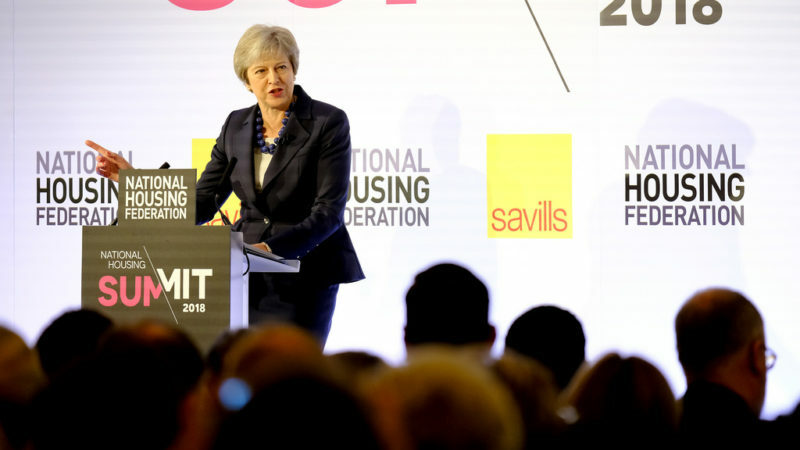 The Prime Minister, in her self-stated quest for the political middle ground and the floating voter, has chosen housing as a key battleground. A series of housing announcements in the last few weeks has, in part, been an attempt to signal that austerity is over, and that Theresa May is ready to tackle the ‘burning injustices’ in a post-Brexit world. So, on national Housing Day, it is worth asking whether these announcements add-up to a new Tory housing strategy, and fit with the anti-austerity and social justice narrative that May is hoping to fashion. First came May’s 19th September pledge to invest £2bn extra in social housing turns out not to apply until 2022, and is spread over six years (up to 2028). This will build around 5-7,000 social homes on average for each of those six years. The upshot of this new investment, if it ever happens, is that it barely makes up for the lowest social house-building programme since the 1920s, nor the extension of Right-to-Buy; both of which Tory-led governments have overseen since 2010. Then came the announcement at the Tory conference to lift the borrowing cap on the Housing Revenue Account of local councils. This was welcomed by housing commentators, as a means of kick-starting council house-building by allowing local authorities to borrow more against their existing housing assets. But this will likely only produce an extra 10,000 social homes each year, with the new housing supply not kicking-in for a couple of years. What’s more, half of all local authorities in England do not fund social housing through their Housing Revenue Account (which this policy effects) – mainly because they have already transferred their council housing to a housing association or arms-length management organisation. So there has been given little thought of how new social homes can be built in these areas. The number of new homes needed each year for the foreseeable future is 300,000, of which around one third need be social homes. If the promised new social homes from May’s announcements are added to the number currently being built, then a maximum of 22,000 social homes will be built in some indeterminate future – one quarter of the number needed. Finally, there was the announcement that rough sleeping would be tackled by introducing a tax on foreign home buyers. Welcome as this could be, it is another example of how the government is wedded to announcing future housing initiatives rather than crafting a strategy that coherently confronts Britain’s burgeoning housing crisis. A key problem with all of May’s pledges, and public heart-wringing, is that collectively they fall way short of what’s needed to sort the country’s housing problems – many of which Tory-led governments since 2010 have intensified: rising homelessness and rough sleeping, a dwindling social housing stock, a decline in affordable house-building, and welfare reforms that have worsened housing problems. By the next general election, whenever it comes, the Tories will have been in power for at least nine years and probably more if the government goes the distance to 2022. For housing, as for many other public services, this has been a lost decade, book-ended by austerity and shrinking the state from 2010; and at the other, the Brexit tragedy and the likely unravelling of Britain’s economy.